CHIAVARI, Italy – One of these days, in the not so distant future, I’m going to be one of the 10 million who visits Florence, Italy this year. (See Statistical Fact No. 23). Working as a fashion journalist in Milan, I used to be in Florence two or three times a year covering fashion event. It was nice work, and they paid me! But I haven’t been there in a few years, not since I changed my life and moved back to the Riviera, so it’s time. 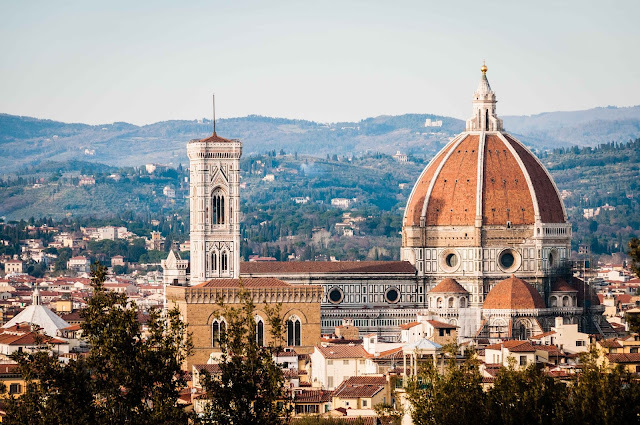 If there is a trip to Florence in your future too, here are some tidbits about the city that I plucked from the Internet that you might find interesting. 1. Amazing Fact: According to UNESCO, almost a third of the world’s art treasures are in Florence, not bad for a small city. The main viewing galleries include the Uffizi, the Bargello and the Academy. The main viewing attractions include the cute Italian guys. 2. 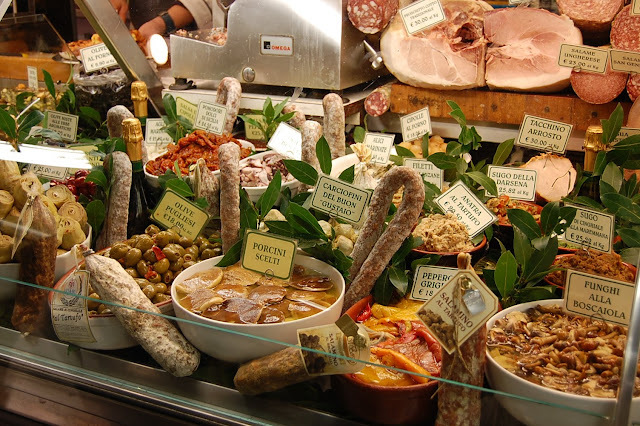 Food Fact: Florence’s Mercato Centrale is one of Europe’s largest covered markets, where the food and the noise compete for attention. By the way, the market stall with the picture of the cute little horse on it, sells horsemeat. Just so you know. 3. Disaster Fact: After torrential rainfall in November 1966, the River Arno rose more than 5.2 meters (almost 18 feet). In two days 35 people were killed and hundreds left homeless as the city, and many of its treasures, was engulfed by silt, sewerage and water. ‘Mud Angels’ as they came to be known, flew in from around the world to help with the massive cleanup and restoration process. 4. Secret Fact: To provide a private passage between the Palazzo Pitti and Palazzo Vecchio, a raised passageway was built in 1565 that runs through the Uffizi gallery and across the Ponte Vecchio. The Prince’s Passage, known as the Vasari Corridor, is one kilometer long, (a little more than half a mile) and contains a vast collection of artwork. You can go there, but tours need to be booked well in advance. For info try the APT, Azienda di Promozione Turistica Firenze, in Via Manzoni, 16. 6. 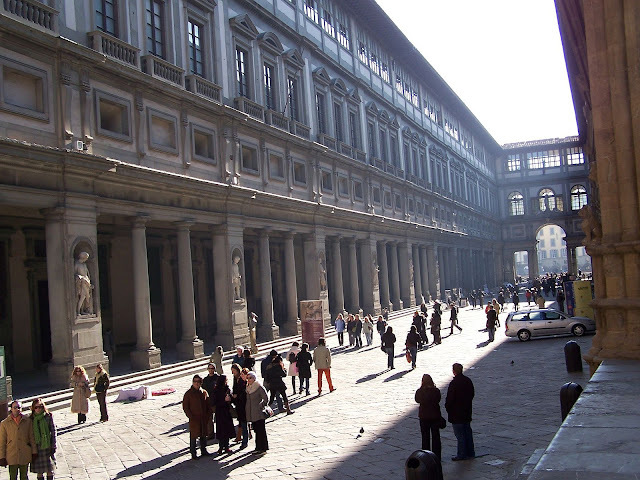 Tourist Fact: The Galleria degli Uffizi is the single most visited building in Italy with some one and a half million people passing through each year. It’s housed in what used to be the administrative offices of the city’s most famous family, the Medicis. 7. Film Fact: Florence has been the star in many a film, capturing the heart of big screen audiences in films such as Tea with Mussolini, A Room with a View, The Stendhal Syndrome and Hannibal. 8. Odd Fact: One of the oddest museums to be found anywhere has to be the Salvatore Ferragamo Shoe Museum, where footwear made from dyed fish skins are among the 10,000 exhibits of privately commissioned shoes. Who ordered the fish skin shoes? Yuck! 9. Street Fact: In 1339 Florence became the first city in Europe with paved streets instead of wood or cobblestones. 10. Woodenhead Fact: Pinocchio, the wooden boy whose nose grows when he tells a lie, was published in Florence between 1881 and 1883 by the Florentine Carlo Lorenzini, who wrote under the pen name Carlo Collodi. 11. Wonderful Fact: On November 30th, 1786, under the reign of the Grand Duke of Tuscany, Pietro Leopoldo, Tuscany was the first modern European state in the world to do away with torture and capital punishment. 12. 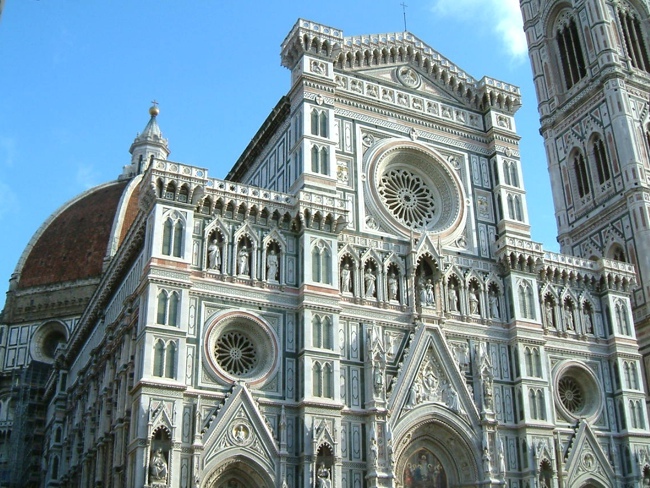 Building Fact: The Duomo of Florence took approximately 140 years to build. Construction of the Cathedral started on September 8th, 1296, and was completed on March 25th 1436. Worth the wait though, don’t you think? 13. Take the Elevator Fact: The Duomo of Florence has 463 stone steps which, if you climb to the top you can reach the cupola for a close-up of The Last Judgment and a sweeping view of the city. 14.Medical Fact: Florence Nightingale, the famous nurse, was born in Florence on May 12th, 1820. She was named for the city of her birth. 15. Roman Fact: Tradition states that the history of Florence began in 59 BC when the legions of Giulio Ceasar founded a village and called it Florentia. After they finished with the village, they played a little calcio Fiorentino and knocked each other around a bit, errrr, a lot. 16.Doesn’t Make Any Sense Fact: The symbol of Florence is a red lily, which is based on the Florentine iris, a white flower that was very common in the local area. What? 17. World War II Fact: Florence was severely damaged during World War II by the Germans, who blew up all its bridges except the Ponte Vecchio. It seems Hitler thought it was too beautiful to destroy. Or so they say. 18.Explorer Fact: Amerigo Vespucci, the famous explorer and navigator, was born in Florence on March 9th, 1454. He’s also the guy America was name after. 19.Language Fact: Dante, Petrarch and Boccaccio were the first to use a language other than Latin, namely Tuscan, which went on to become the recognized language of Italy and called Italian. This was the beginning of the end of Latin being used as the common language throughout Europe. Such is life, or as they say in Latin: Pro Bozo Publico – Support your local clown (or language). 20. Musical Fact: The piano was invented in Florence around 1720 by Bartolomeo Cristofor. It was based on the harpsichord and was originally called a pianoforte. 21. 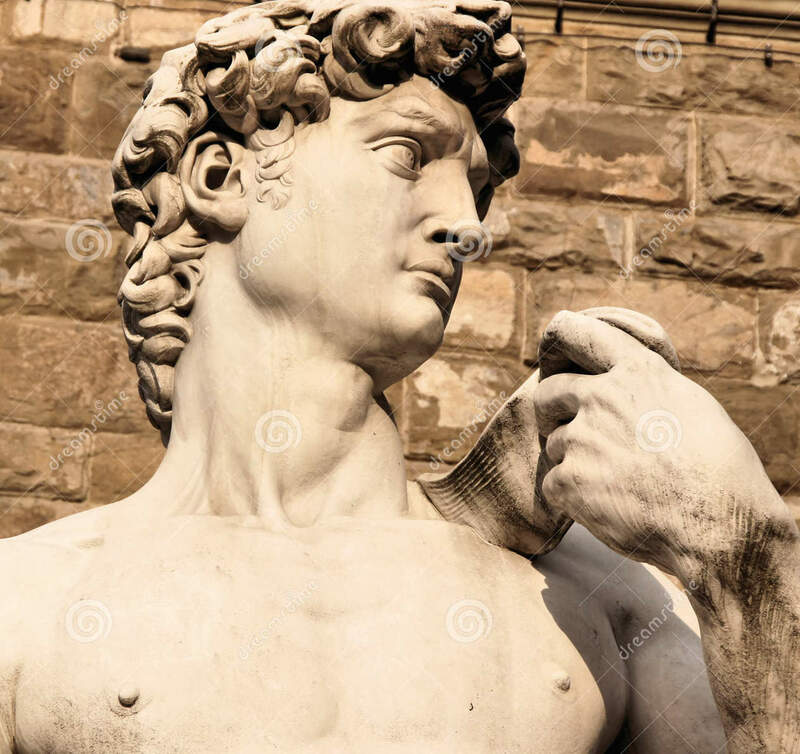 Artistic Fact: The right hand of the statue of David is disproportionately large compared to the body because in the Middle Ages David was commonly said to be of “manu fortis” – strong of hand. 22. Food Fact: Tuscan bread is usually made without salt, and has been since the 12th century. It seems that people of Pisa thought blocking shipments of salt to Florence would force the Florentines to surrender in whatever battle they were involved with at the time, and there were many. Instead, the people of Florence just made their bread without salt and for some weird reason they still do. 23. Statistical Fact: The City of Florence attracts over 10 million visitors per year. 24. You’re Making Me Hungry Fact: A famous Florentine specialty is the bistecca alla Fiorentina, a mammoth chargrilled t-bone steak. 25. Artistic Fact: The Galleria degli Uffizi (Uffizi Gallery) has the world's largest collection of Renaissance art, most of which was collected by members of the Medici family during the 16th and 17th centuries. The Medici’s were very rich. 26. Sad Fact: Florence has had two floods both on November 4th, the first in 1333 and then November 4th, 1966. 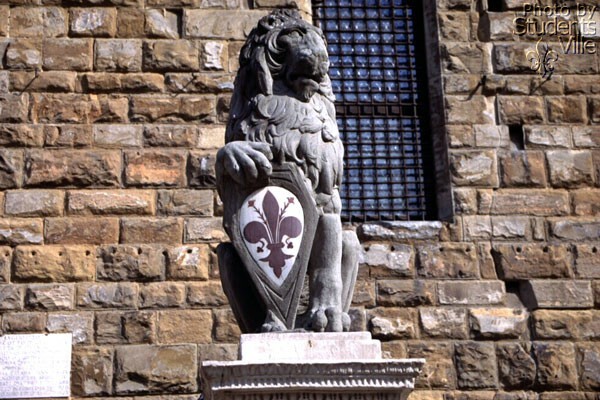 27.Weird Fact 1: One of the symbols of Florence is the Marzocco, a seated lion with the emblem of Florence resting on its paw. 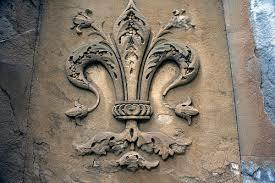 The name comes from the Roman God Mars, which was the very first symbol of Roman Florentia. They eventually replaced the Marzocco with the lily, which was a good idea as lily is a lot easier to say than Marzocco. That doesn’t change the fact, however, that during the Middle Ages live lions were kept behind the Palazzo Comunale, and watched very closely during times of crisis because it was believed their behavior foretold the fortune of the State. This must be a true story because you can see the lion symbol engraved on every cornerstone and doorstep of the Ponte Vecchio. I think there is more to this story, I’m going to have to do some digging. 29. 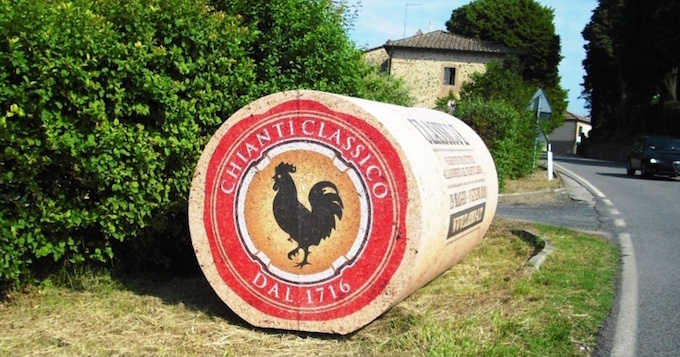 Interesting Fact: Via Chiantigiana is one of the most beautiful roads in all of Italy. 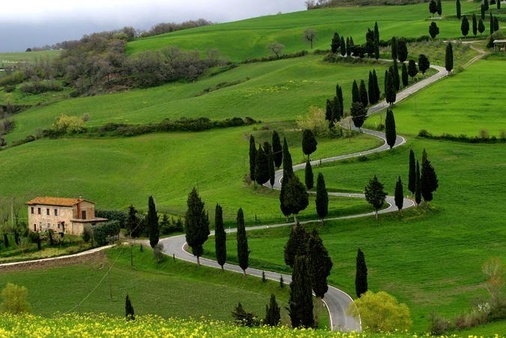 It winds through the vineyards and woodlands that connect Florence to Siena. 30. Game Fact: Calcio Fiorentino (also known as calcio storico or historic football) is an early form of football that originated in 16th century. It’s a combination of rugby, football, bare knuckle fighting and hair pulling. In other words, knocking the beejeebers out of each other. What fun! Very interesting. Thank you, Phyllis.